“Joan Miró: Birth of the World,” on view through June 15 at the Museum of Modern Art, is both a delight and a revelation. The delight comes from seeing so many of the artist’s early and mid-career works together. The revelation is the work’s variety and subtlety, as well as the level of innovation Miró achieved under the influence of Cubism and Surrealism. Drawn almost entirely from the museum’s extensive Miró holdings, plus a few strategic loans, the exhibition features well-known staples of the permanent collection galleries and obscure examples that rarely make it out of storage. Apart from illustrated books and other graphics, MoMA owns few of Miró’s late works, so the focus is on the key aspects of the artist’s development, from his youth in his native Barcelona to the 1950s. Joan Miró, The Birth of the World, 1925. Oil on canvas?98 ¾ x 78 ¾ in. Acquired through an anonymous fund, the Mr. and Mrs. Joseph Slifka and Armand G. Erpf Funds, and by gift of the artist. The show takes its title from The Birth of the World, a 1925 masterpiece that has been regularly on view since its acquisition in 1972. The large canvas is both a culmination of Miró’s progress from Cubist-derived abstraction and a foretaste of the deeply personal language of abstract form that would place him in the vanguard of European modernism. To describe it as ahead of its time is an understatement; it would have seemed startlingly new if it had been painted in 1950. 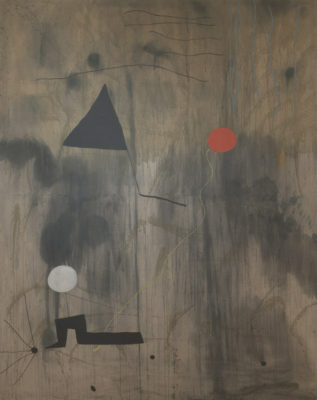 Its background of spontaneously flung, thinned-out oil paint prefigures both Pollock and Frankenthaler, neither of whom could possibly have seen it when they were developing similar techniques, since it disappeared into a private collection soon after completion. And the simplified, ambiguous motifs that dance across its surface became a hallmark of Miró’s work from then on. This is not to say that Miró hadn’t already evolved a singular approach to abstract imagery. A few early paintings, including an impressive 1920-21 still life with a rabbit and fish on a tabletop—a response to his first visit to Paris and exposure to Cubism—simultaneously simplify and elaborate on his observations, analyzing and interpreting them in his own terms. Still, it wasn’t until he returned to Spain that he was able to synthesize the distinctive formal vocabulary that was embraced by the Surrealists. An emblematic example is The Hunter (Catalan Landscape), 1923–24, which the movement’s founder, André Breton, acquired the year after it was painted. 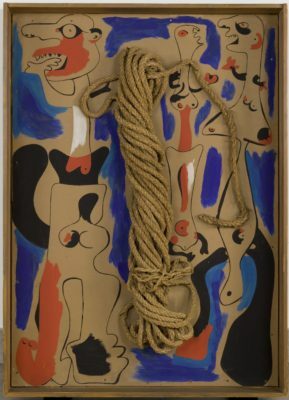 Joan Miró, Rope and People, I, 1935. Oil on cardboard mounted on wood, with coil of rope,? 41 1/4 x 29 3/8 in. Gift of the Pierre Matisse Gallery. Miró’s art has remarkably broad appeal, in large part because, like Calder’s, his work has a playful quality. But the amusing aspects of his forms often mask a troubling emotional undercurrent engendered by the political and social upheavals of the mid twentieth century. Surrealism arose in interwar Paris in response to those conflicts, and for Miró it confirmed a direction in which he was already heading. Unlike the Surrealists, however, he didn’t rely on chance and the unconscious to generate imagery. He invented a system of cryptic symbols that recur like pictographs, and he planned his complex compositions carefully, as the detailed study for Dutch Interior (I) illustrates. Virtually everything in the drawing also appears in the 1928 canvas, which is based on a seventeenth century painting he saw on a trip to Amsterdam. This is about as far from “pure psychic automatism” as you can get. For all their quirky charm, Miró’s distorted figures are often in distress, anxious or agitated. Little wonder, when the artist’s native land was in turmoil, culminating in civil war in 1936, followed three years later by the century’s second global conflict. In the two versions of Rope and People, for example, twisted hanks of rope are surrounded by schematic figures that seem to be just as wound up, crying out and waving their hands like witnesses to a catastrophe. Painted in Barcelona on the eve of the civil war, they foreshadow the massacre at Guernica that Picasso would memorialize. In an extraordinary self-portrait, painted in Paris in 1937-38, Miró reflects his own image as a translucent shadow-man, pale and grey, with touches of pastel that seem to drain from his ghostly form like the last wisps of vitality. Surrounded by a galaxy of his symbolic images, some of which cling to him, he stares out at us hypnotically, as if transfixed by his own lack of substance. To me, it reads as a commentary on his helplessness. Like his rope-people, all he can do is bear witness to humankind’s inhumanity. Ever since 1950, when the so-called Irascible Eighteen protested the Metropolitan Museum’s lack of interest in contemporary art, the Met has been playing catch-up. Things improved under the aegis of curators Robert Beverly Hale and Henry Geldzahler, and some recent acquisitions signal that the museum is making an effort to keep up with the times. But the current show, “Epic Abstraction: Pollock to Herrera,” covering the period from the 1940s to the present and drawn primarily from the permanent collection, is an illustration of why the Met is known for its scattershot approach to modern art. The first problem, even before you enter the galleries, is the show’s title. How is epic defined? Clearly not in the dictionary sense, or even coherently in the introductory text. Is it about expansive ideas and subjects (broad), or existential concerns of the self (narrow)? The installation does nothing to resolve that dichotomy. Nor does one or the other of those two extremes apply to all, or even most, of the works on view. Frankly, apart from the obvious candidates and some that could arguably qualify in spite of their modest size, a lot of the choices left me perplexed, not least the subtitle closer. Much as I admire Carmen Herrera’s work, shown so beautifully at the Whitney a few years ago, I fail to see why she was picked to bracket the selection. Her long career is epic by any definition, but her individual canvases are not. The single painting at the Met—one of the works on loan from private collectors—is a fine example of her geometric style, but it hardly represents a monumental artistic statement. Pollock, on the other hand, is the obvious choice to begin such a survey, and the Met owns an exceptional cluster of four major canvases. They are followed, in canonical fashion, by a gorgeous room of Rothkos, as if to establish the benchmark against which the rest of the show must be measured. 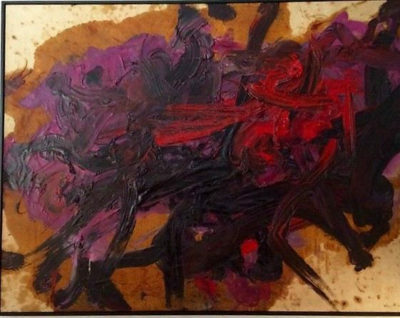 Kazuo Shiraga, Untitled, 1958. Oil on paper mounted on canvas, 71 5/8 x 95 ½ in. Richard Roth Collection. Fortunately the canon is disrupted by a terrific 1958 action painting, also on loan, by Gutai artist Kazuo Shiraga, who painted with his feet while hanging from a rope. It’s a bit misleading to pair him with Pollock, as if their approaches were similar, which they weren’t, but it does show that expressive abstraction had international ramifications in the postwar decade and beyond. And at the center of the Rothko room, Kouros, a powerful 1945 sculpture by Isamu Noguchi, extends the language of biomorphic abstraction into three dimensions. The remaining galleries are crowded and far less coherent, in part because, apart from Clyfford Still and Bridget Riley, each artist is represented by a single work. Standouts include Willem de Kooning’s Easter Monday, 1955-56, a big canvas for the period, full of energized brushwork and intriguing offsets from the newsprint he used to blot the paint—most prominently, a movie ad for “Alexander the Great.” It’s no wonder de Kooning was Robert Rauschenberg’s avatar. Helen Frankenthaler, Western Dream, 1957. Oil on canvas, 70 x 86 in. 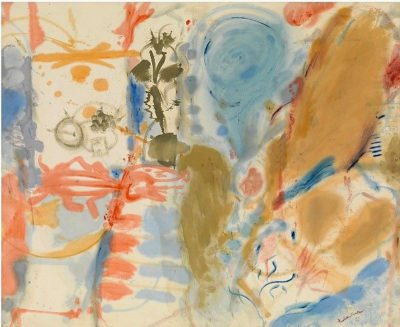 Lent by the Helen Frankenthaler Foundation. A large Helen Frankenthaler, Western Dream, 1957, on loan from her foundation, is a wonderful early example of her signature stain painting technique. Thornton Dial’s Shadows of the Field, 2008, made of rags and cotton on a metal frame, is an imposing and disquieting monument to the enslaved field workers of the South. And Joan Snyder’s big, bold Smashed Strokes Hope, 1971, a promised gift to the Met, commands the wall with authority. If only these outstanding pieces had more breathing room. For sheer physical monumentality, however, you need look no farther than Louise Nevelson’s Mrs. N’s Palace, a room-scale construction made over a thirteen-year period from wood she collected on the street. More than a hundred separate elements form the walls, and a floor of mirrored black glass is visible through the entrance. You can readily imagine the formidable Nevelson spirit, epic in its own right, enthroned inside. The Met is to be congratulated for looking beyond the usual suspects—white, male, American—to a much wider range of abstract artists past and present. It’s always a treat to see things that rarely make it out of storage, but a selection that lives up to its billing, even if a smaller one, would have been better. And the strategic loans are reminders that, where modern art is concerned, the Met still has plenty of gaps to fill. 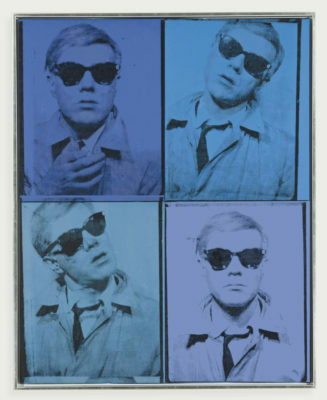 Andy Warhol, “Self-Portrait,” 1963-64. Silkscreen and acrylic ink on canvas, four panels 40 x 32 in. overall. Cingilli Collection. Question: what’s the difference between an S&H Green Stamp and the Mona Lisa? Answer: nothing, when they’re silkscreened multiple times by Andy Warhol. Or, for green stamp, substitute Marilyn Monroe. Or switch out Mona for a dollar bill. Those images and many more have become touchstones of 20th century art, not only in America but around the world. Seeing them gathered at the Whitney Museum for the exhibition, “Andy Warhol: From A to B and Back Again,” on view through March 31, is a sobering reminder of Pop art’s enduring impact on visual culture, as well as an object lesson in branding against type. The Whitney exhibition is billed as the first comprehensive New York presentation of Warhol’s work since MoMA’s 1989 retrospective, two years after the artist’s untimely death at 58, caused by complications from gallbladder surgery. In the catalog of that earlier show, the art historian Robert Rosenblum described Warhol’s subject matter as “the most commonplace facts of visual pollution in America that would make the aesthetes and mythmakers of the fifties cringe in their ivory towers.” And cringe they did, even as a few prescient dealers and a new generation of collectors jumped on the Pop bandwagon. The art world was knocked on its kiester by the unlikeliest successor to Pollock, de Kooning, Rothko and Klein—a gay misfit from Pittsburgh who lived with his mother and drew shoe ads for I. Miller. After introducing itself with a few of Warhol’s greatest hits—Brillo boxes, Coke bottles, Campbell’s soup cans—the Whitney show does an admirable job of surveying his early career as a commercial illustrator, with a selection of book and magazine layouts that remind me of Ben Shahn’s graphics. There are also some juvenilia, eccentric character sketches of his friends, and drawings of shoes as surrogate portraits, in which we see Warhol’s singular linear style emerge. Then on to the hand-drawn newspaper, advertising, and cartoon knockoffs, for which source material is also displayed. Much of the documentation comes from the Andy Warhol Museum in Pittsburgh, a more inclusive and, to my mind, more revealing treatment of Warhol’s career. But since we’re not in Pittsburgh, we have to take the Whitney’s version at face value, though with a grain of salt. 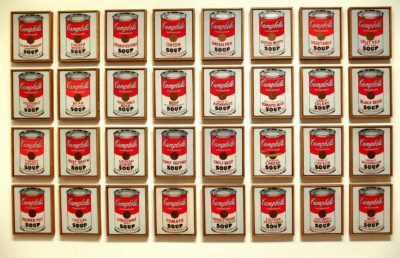 Andy Warhol, “Campbell’s Soup Cans,” 1962. Casein, acrylic, and graphite on linen, thirty-two panels 20 x 16 in. each. The Museum of Modern Art, New York. The presentation segregates key aspects of that career away from the primary installation on the fifth floor, making it appear as if Warhol channeled most of his creative energy into the screenprinted canvases of pop-culture icons, car crashes, and self-portraits. Like the visual equivalent of a drumbeat, his repetitions reduce even the most compelling imagery, such as the mangled body of a suicide jumper and police dogs attacking civil rights protesters, to virtual illegibility. Conversely, his oxidation and camouflage paintings elevate random and utilitarian patterning to the level of abstract art. This kind of irony is classic Warhol, and there’s plenty of it here. To get a fuller picture of Warhol’s achievements, however, you need to look elsewhere. Apart from a sampling of his Screen Tests and a group of Interview magazine covers, there’s little evidence of his wide-ranging enterprises, from film, video and television (he even had his own cable TV shows) to music, theater, product endorsements and the commissioned portraits that comprise the bulk of his oeuvre. The moving images and prints are on the museum’s third floor, and a large group of the portraits is in an easy-to-miss side gallery off the main lobby. I confess that I skipped the films. Having sat through several of them when they came out, I have no desire to revisit them. The portraits are even more slick and shallow than his Jackie and Marilyn and Liz, which themselves were not take seriously by the art-world cognoscenti when they first appeared in the 1960s. I still find it astonishing that an artist who celebrated superficiality and constantly downplayed any serious consideration of his motives—one whose philosophy ran the gamut, as he put it, from A to B and back again—has risen to such a level of international renown. His avowed ambition was not to make great art but to be rich and famous, and by golly he succeeded on both counts. The exhibition tries to attribute deeper meanings, but I’m not convinced. Until very recently, if you were to ask an American to name a famous Swedish artist, the likely answer would have been August Strindberg or maybe Claes Oldenburg. 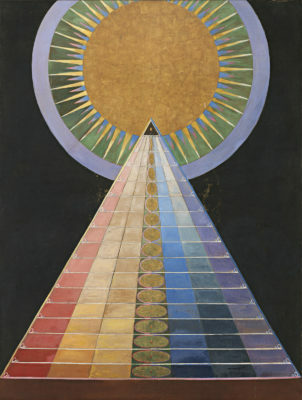 The name Hilma af Klint would not have been on the tip of anyone’s tongue. That changed last fall with the opening of the Guggenheim Museum’s exhibition, “Hilma af Klint: Paintings for the Future,” on view through April 23. The show brings out of obscurity one of the most innovative artists of the twentieth century, but one who deliberately sequestered her work, believing that the world was not ready to appreciate it. Hilma af Klint, Group X, No. 1, Altarpiece, 1915. Oil and metal leaf on canvas?, 93 ½ x 70 ¼ in. The Hilma af Klint Foundation, Stockholm. 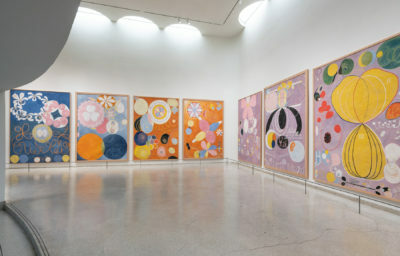 The Guggenheim is the ideal venue for this, the first af Klint retrospective in the United States, since its founding collection celebrated painters such as Mondrian, Léger, Moholy-Nagy and especially Kandinsky, considered the pioneers of non-objectivity. In fact af Klint, who shared Kandinsky’s interest in Theosophy, was creating spiritually inspired non-objective paintings as early as 1906, five years before Kandinsky’s book, Concerning the Spiritual in Art, spread the gospel of abstraction devoid of representational content. Unfortunately for posterity, she rarely exhibited anything from that body of work during her lifetime, and stipulated that it was not to be shown publicly until twenty years after her death, which occurred in 1944, the same year as Kandinsky’s. Born in 1862 in Stockholm, af Klint began her career as a traditional painter and illustrator. In 1904, she joined four other female artists to hold séances in the hope of channeling guides to lead them toward art that expressed a reality beyond the observable world. Known as De Fem (The Five), the group created automatic drawings, a common practice among spiritualists at the time. But in af Klint’s case, they became her primary artistic inspiration. As she later explained, one of the guides commissioned her to undertake a monumental nine-year project she called “The Paintings for the Temple.” When it was completed in 1915, the series comprised nearly two hundred paintings and works on paper. Installation view of seven paintings from The Ten Largest series, 1907. Tempera on paper mounted on canvas, each approx. 124 x 92 in. The Hilma af Klint Foundation, Stockholm. The show opens with “Group IV,” a suite of ten mural-size paintings from that series, completed in 1907. The imagery, derived from folk art and her own visionary introspection, symbolically depicts the human life cycle. She intended them to be wall decorations for the temple, which she imagined as a structure with multiple levels connected by a spiraling path. By coincidence, that could describe the museum itself, conceived by Frank Lloyd Wright as “a temple of spirit.” Given af Klint’s focus on transcendent imagery, it’s not inconceivable that if Solomon R. Guggenheim and his curator, Hilla von Rebay, had known of her work, they would have snapped it up for the collection when it started in the 1930s. Filled with arcane shapes, annotated charts and references to primordial life, af Klint’s oils and watercolors illustrate a rich interior life of formal invention, an effort to picture unseen forces that are no less real for being invisible. The search for wisdom and meaning in a rapidly changing world, at a time when science and technology were challenging old norms and beliefs, led af Klint to explore concepts beyond conscious perception. Considered alongside the introduction of electric lighting, the telephone, X-rays and other innovations, her art is an attempt on her part to make sense of a universe in which such inexplicable phenomena occur. At times her imagery lapses into mysticism bordering on superstition, but frankly it isn’t necessary to decode all the occult philosophizing. Even skeptics and materialists can enjoy the sensuousness of her colorful Eros series, and the complex symmetrical variations in the Evolution and Tree of Knowledge groups and Altarpieces. Her explorations of formal and chromatic relationships prefigure Albers and Klee. However, the fact that af Klint refused to share her work with the wider world meant that no one outside her small circle was aware of her accomplishments. Her belief that a future audience would be receptive to her vision prevented her from receiving timely recognition. Finally, 75 years after her death, the Guggenheim has become, at least temporarily, the spiritual temple she envisioned.